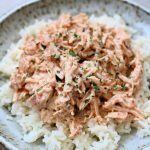 Shredded chicken with a creamy, flavorful sauce that’s made quickly in your Instant Pot. And you can make rice at the same time in the same pot to serve with the chicken. An easy dinner for any night of the week. Chicken: Pour the broth into your Instant Pot. Add your chicken to the pot in an even layer. Optional Rice: If making rice use the pot in pot method. Use a pan that fits inside your Instant Pot*. Pour 1 cup uncooked rice in the pan and then pour in 1 ½ cups water. You can make more rice than this if you’d like. Just use a 1 to 1 ½ ratio of rice to water. Place a trivet (I used this trivet sling*) on top of the chicken and place the rice pan on top of the chicken. You’ll want it as even as possible so the rice cooks evenly. Pressure Cook: Cover the pot and secure the lid. Make sure valve is set to sealing. Set the manual/pressure cook button to 12 minutes for thawed chicken or 15 minutes for frozen chicken. When the time is up let the pot sit for another 5 minutes (display will read L0:05). Then move the valve to venting. Remove the lid. Remove the rice pan and set aside. Use tongs to place chicken on a cutting board. Discard the broth. Shred or cut the chicken up. Then add it back into the pot. Make the Sauce: In a bowl stir together the mayo, sour cream, picante sauce, cajun seasoning, parsley, dill and cumin. Stir the sauce into the chicken. Serve: Serve the chicken over rice. Squeeze one lime wedge over each serving of chicken. You can also serve this chicken on buns or in lettuce wraps. To make gluten free: Make sure your chicken broth has no gluten in it. Check the label. I used my 6 quart Instant Pot Duo 60 7 in 1*. You can also use a 3 quart or 8 quart Instant Pot for this recipe. The 3 quart won’t be able to make the pot in pot rice.